I say this to protect you from pre-party insanity, budget busting and over catering. Really, when I first started doing parties I would go a bit mad, preparing food and hours and hours were spent making the perfect morsels. Imagine a table groaning with food and believe me it takes about five seconds to eat whatever you have served, remember adrenalin is high and you don’t even need all the tricks of a fast food place (loud up beat music, red furniture, whatever) and then ummm you have an hour and fifty five minutes of fully fueled kids to keep busy… Trust me if you have energy to spare (hahahaha) and you want a memorable party then spend it on activity planning. 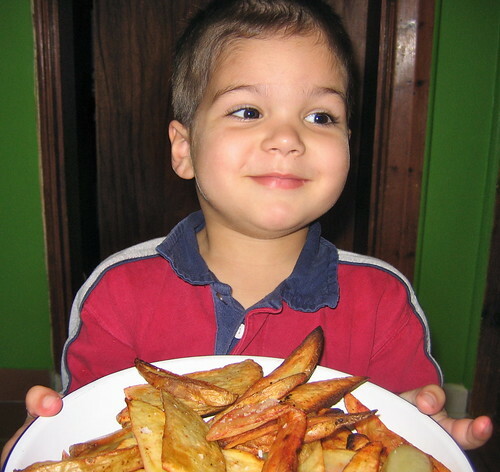 Really, keep it simple, at a recent party we served potato wedges and salsa between games and crafting – gobble, gobble, gobble and they were good to go on with the fun. 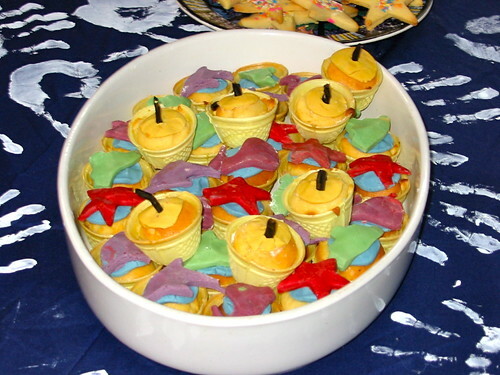 Even a plate of fruit slices will get munched up (even by fussy I don’t eat this kids) – if you say nothing and leave it on the side they will eat… Food is a wonderful way to bring people together but it is not the focus of a little kids party. Otherwise – and I keep saying this (! 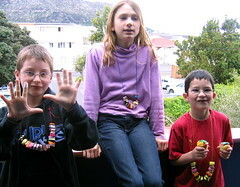 ), be creative – kids are very forgiving!!! We once chopped up some take-out ribs and had a pile of frogs legs at a frog prince party. Kids love gross or disgusting… make them eat sweetie bugs as a challenge; or worms; or snakes; marshmallow mice as ship rats; once we used sherbet to clean their teeth, like the Romans used crushed mouse brains. We used to have a donut store nearby and boy can they be adapted: life rings in an ocean theme, planet rings for a space party, tyres for a tractor party. 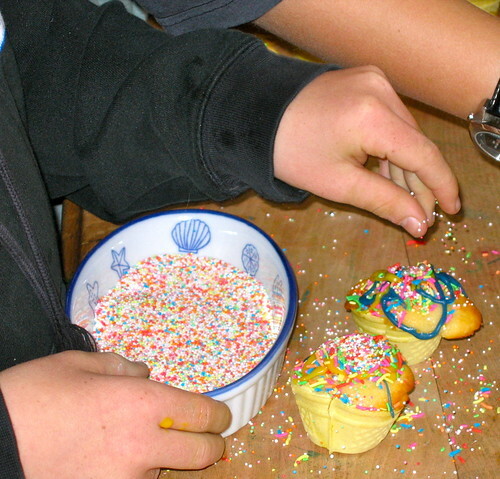 You can also include snacks in your party games. Here are some guys eating foot sweeties with no hands… cannibals at an explorer party. 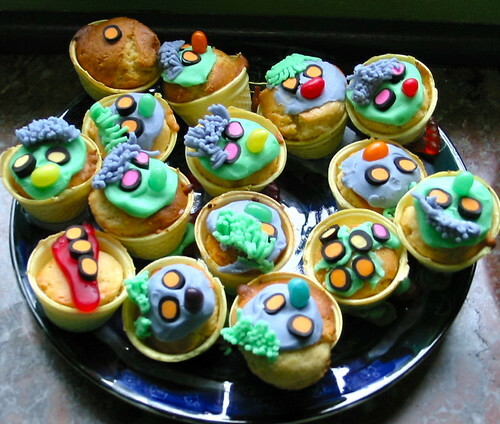 Or include snacks with the party crafts. 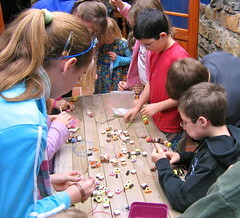 Here they are threading liquorice all-sorts on scooby-doo wire for necklaces. 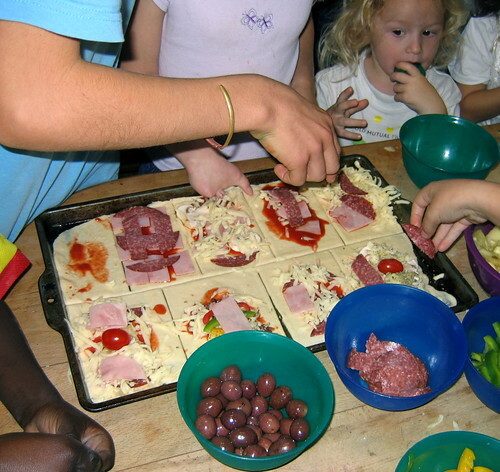 Pizzas: Where they do the toppings: cheese, tomato, salami, bacon, olives, pineapple, peppers, tomato, feta, garlic, herbs, mushrooms. Hamburgers/Hotdogs: With all the condiments. 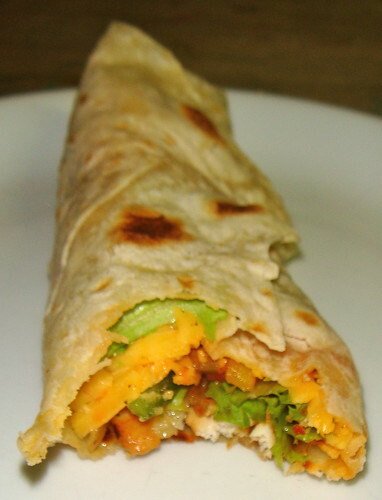 Ketchup, chutney, fried onions, sliced tomatoes, sliced cheese, lettuce, gherkins. 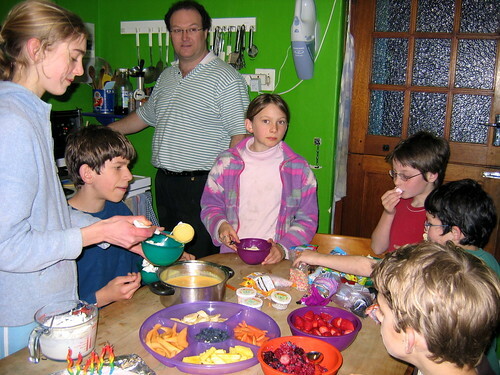 We have had two dessert parties where they gathered together and made sundaes and another was a fondue. It really was easy – less really is more!!! 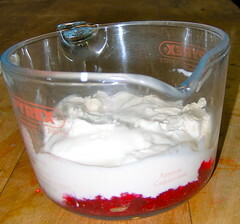 Sundae: Provide one or two flavors of ice cream and a bunch of toppings: sprinkles, any kind of berries, fudge is good, caramel or chocolate sauce… really just give them the tools and they will manage the rest. 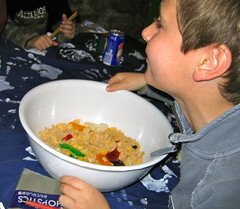 Fondue: We did two different fondue dips – a chocolate and a caramel one – easy to make: equal parts chocolate to cream or caramel sweeties (they melt in the pot) to cream: slivers of fruit to dunk, wafer biscuits and marshmallows. What about treats – it is a party after all!!! Let them decorate cupcakes – they really fit into any theme… Look at Family Fun for endless birthday cupcakes ideas or any cupcakes: You provide cupcakes; different colored icings; and a variety of sprinkly things. Also, it is really quite easy to make icing with a heap of icing sugar and make it so thick that it goes into a paste that can be rolled out thinly and use cookie cutters to cut shapes and then pop onto cupcakes. 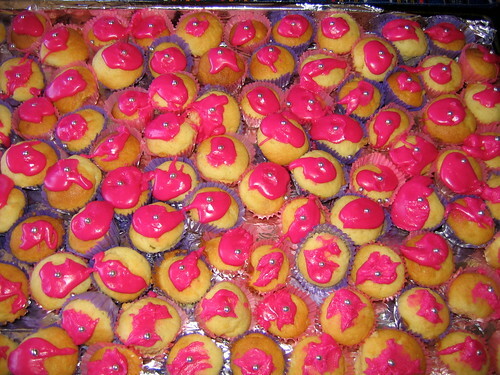 Here are some yellow submarines, in a sea of starfish (the stars were cut out of thick icing described above); some monster cupcakes and teeny tiny fairy cakes. Otherwise, jelly treats are a great option, especially if you are having kids that are allergic to dairy – a small jelly treat is usually allowed. 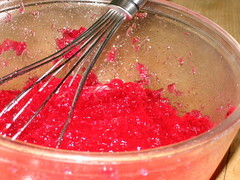 Make the jelly as usual but only use half the water. then let it set in a flat dish. Turn the jelly out onto a board and use your friendly cookie cutters to cut jelly shapes. 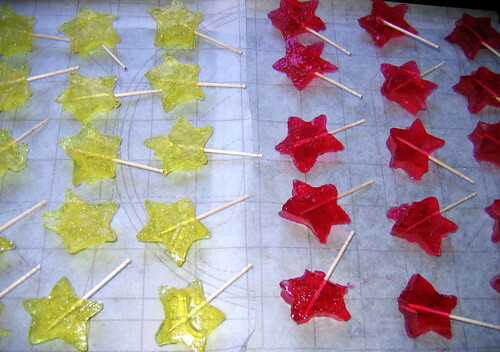 I have used stars and toothpicks to make tiny bit size wands. Finally – I don’t know why the cake is the most important/memorable whatever part of any party – you will have to ask a kid! – but it is: the cake is the thing that they remember a party by. It is vitally important!!! Really after all the other things you do to make the party fun – it is the cake that goes down in history… and you will see from my examples below that kids really, really are very forgiving. 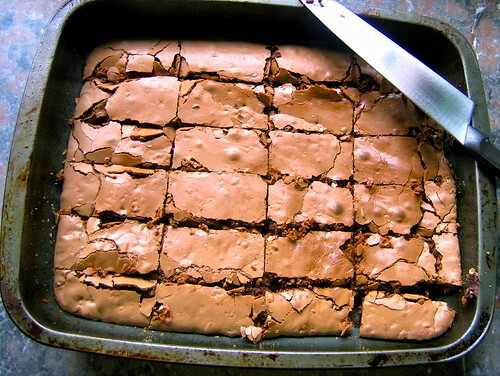 I always make ice-cream cakes – never bake cakes, because kids just eat the sugar icing off baked cakes and you are left with lot of very yucky crumbs mushed around the place. The easiest thing – scoop the cake into cones and they munch it up. 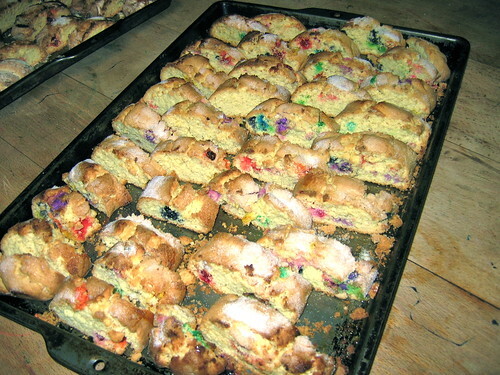 Also I usually surround the cake with some jelly (for non-dairy kids – just pop it in their ice-cream cone) – and how often do you need blue jelly – for water, sky whatever – and it isn’t always easy to find – Huge Hint: blue jelly… add blue food coloring to red jelly – it makes a deep purple, passable blue… don’t even try with yellow or orange you will end up with green or worse brown sea. Trust me ice-cream cakes are easy! Here is a recent bug cake – really just a bowl of ice cream turned out and decorated with sprinkles and some licorice strip legs – done! 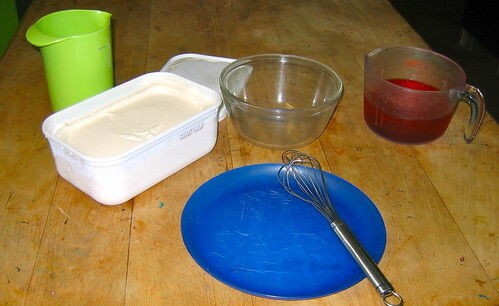 So how to make an ice-cream cake: Take your regular ice-cream, homemade or shop bought; place it into shaped containers, glass and plastic work best, and gather up the necessary pieces of the cake. 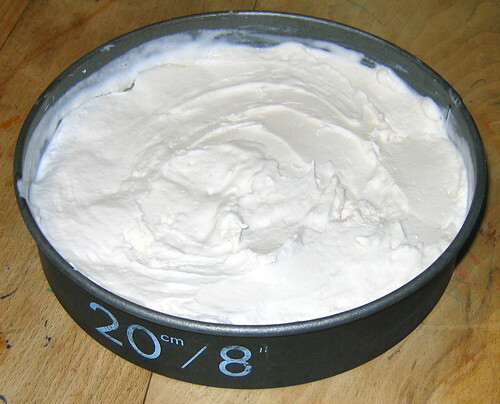 Let them freeze hard, then float the container in a sink of warm water and they will tip out easily. Build your shape and put it back into the freezer for a while to settle. 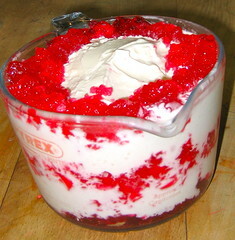 Finally whip some cream, and split it into smaller containers add different color food colorings to little bowls and ice your cake with the cream – ice cream and cream is pure heaven!!! 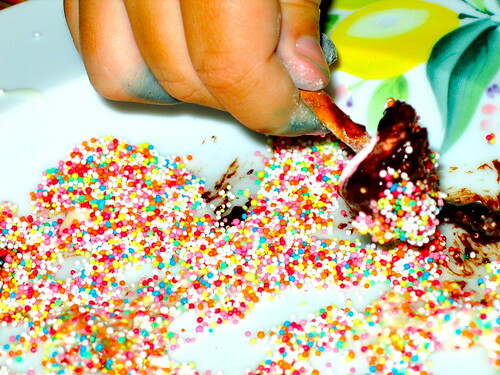 Pop it back into the freezer until you need it – decorate it with sweets and other embellishments once you take it out of the freezer. 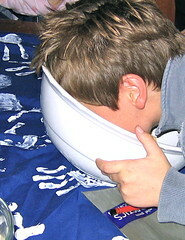 Here is a quick tutorial from a recent party we had… and just like kids I expect you to be forgiving!!! It is a Cat in the Hat – I am telling you that for a reason… otherwise you may never have known, it was a bit last minute and reflects that! Then just layer up alternating jelly and ice-cream for the stripes of The Cat in the Hat’s Hat… and pop it back in the freezer to set. 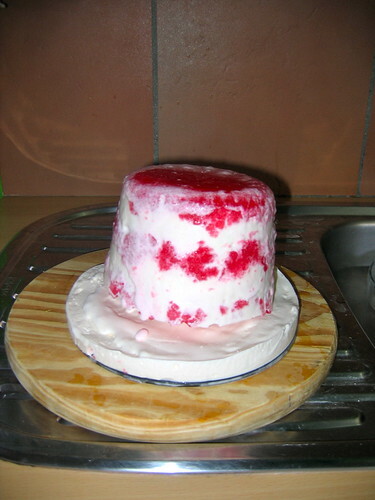 Then I put some ice-cream in a cake pan – to make the hat brim, pop that back in the freezer to set. 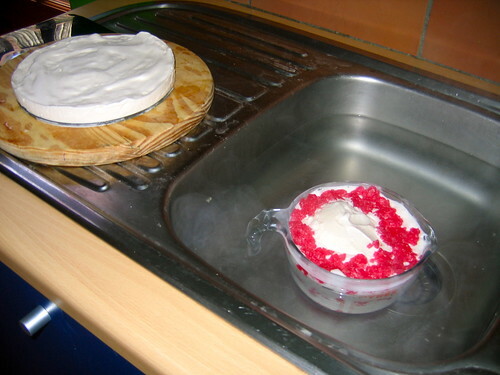 And when all is set and you are ready float the bowls in warm water and the ice-cream pops out. And you can put your cake together. This cake didn’t need any extra decorating, so we were done. Just to remind you (!) The Cat in the Hat’s Hat. Now I was planning to add on a couple of past cakes pictures and realizing that we have had 37 parties in the last ten years that the post might be a bit burdened, not to mention I am sure there are people on the internet who have actual work to do!!! 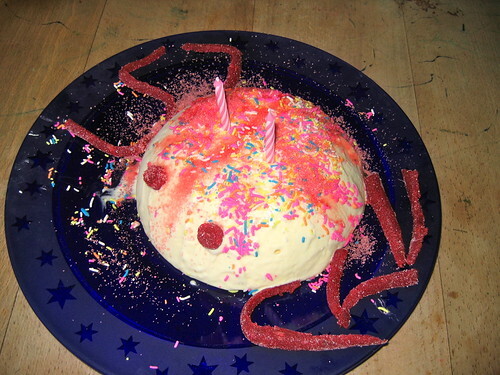 So I will post a post with Se7en Bazillion Cake Ideas later. And moving on with the great party series: Se7en Steps to a Good Party, will carry on next week with the final installment on Treasure Hunts. Prev Where the Wild Things Are… Shadow Puppets. THANKS FOR THE GREAT IDEAS AND EASY RECEPIES. Hi A, Thanks for stopping by! 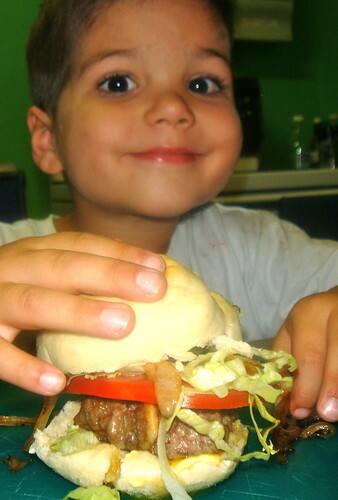 Glad you liked our party food – Have a great weekend!!! Love your Cat in the Hat cake. My son (who is turning 6) loves the book and I am sure it would be a useful way of persuading him to choose something other than transformers for his cake. Hi R, Oohhh we had a lovely Cat in the Hat party… Hope he has a mind transformation, for your sake!!! Have a great week!! !